I spent the entire day in Denver yesterday. After my Fox News interview early in the morning and waiting before my NBC Denver 9 live interview I drove around the Mile High Stadium area taking photos of over 10 high density buildings, these were raw vulnerable wood framed projects. Click to see I was suprised to see many of these projects still had no security whatsoever while some had high security fences that are still easy to penetrate if someone is determined. I wonder if those builders really think the fire that killed the 2 construction workers during the day was really an accident. We will be notifying those builders that Mighty Fire Breaker™ is ready to defend Denver builders from job site fires to make there jobs safer for all their workers. 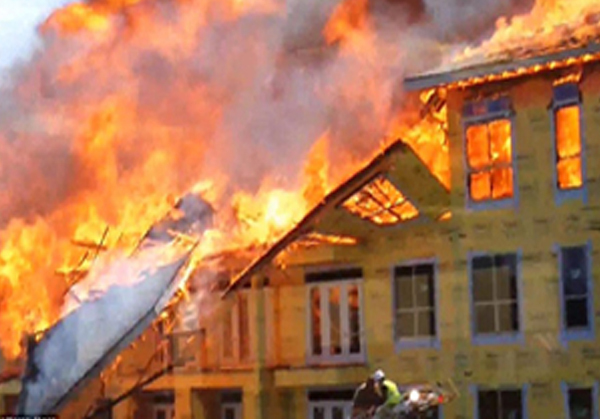 Exterior fire walls do nothing to defend wood framed building during construction there is only one solution NOW and that is to defend 100% of the interior raw lumber as its being framed with a UL GreenGuard Gold Certified Fire Inhibitor. The big question for our national builders now is HOW EXPOSED ARE YOU TO LITIGATORS now that best practice fire protection during construction is available to all US builders? The new Sleeping Giant in the Building Industry is fire during construction and workers safety after we lost 2 workers during the day to a fire. Biznow panelist might say 20 fires in the last 18 months is a small percentage but builders should recognize their project could be number 21. M-Fire is in support of our great American Builders and we want to defend them against all the negative propoganda about lumber being a cheap way to build. If lumber built buildings are under attack we all need to be Smarter Than The Attacker's and The Wood.